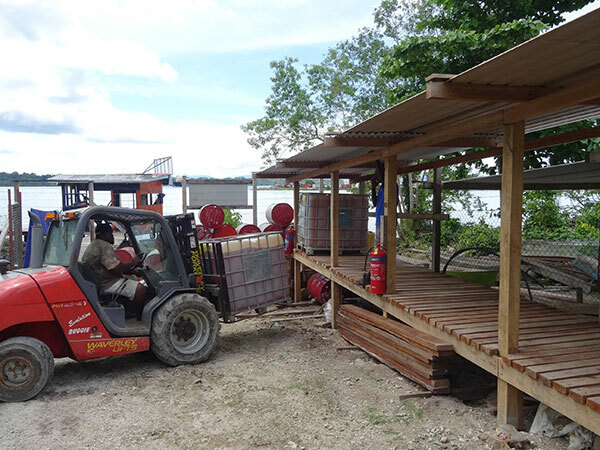 Silentworld presently operates over twenty franchised fuel re-sale sites spread across the provinces of the Solomon Islands. Re-sale sites stretch from Shortlands, in the far West, to Lata Santa Cruz, in the far East, a distance spanning almost 1000km. Silentworld landing craft and mobile 4 wheel drive fork lifts deliver both ULP and ADO in 1000 litre iso units, thus eliminating the need for the old 200 litre drums. This in itself greatly reduces the handling and risks of drum loss to the local sellers. In the Silentworld model there is also no need for drum deposits, again a big drain on local re-sellers. Environmental damage is greatly reduced with the elimination of the drums which are often left lying around after use. Silentworld imports its fuel and mix oils directly from Australia and is of the highest quality sold in the Solomon Islands.